New media artist and University of California-San Diego faculty member Ricardo Dominguez was threatened with revocation of tenure this past spring over protests made by three Republican congressmen against state funding of his projects to create cell phones that could lead migrants to fresh-water stations in the desert, and another to initiate a “denial of service” virtual sit-in against college fee hikes on the UC president’s home page. Dominguez’ institutional censure is hardly up to the level of hardship endured every day by thousands of illegal immigrants, especially since such notoriety can hardly hurt his art career. But it makes the point that there are real stakes, and a real audience, in the new culture wars around socially engaged art, as well as in the much larger propaganda battle over immigration. The reason Dominguez’ work attracted animosity was because it initially caught the attention of major media outlets, including CNN, owing at least in part to his ideas. The quality (and thus the power) of aesthetic works that take on important issues is… important. The effect of a clear, strong statement is immediate in the video interview that Chicago artist Miguel Cortez shot with his parents; it simply presents his father’s memories of the brutality he repeatedly experienced in his younger days at the hands of border police, when he wasn’t given passage to come work in almost equally brutal conditions. The video is part of “Sangre, Sudor y Papeles” (“Blood, Sweat, and Papers”), a group show, now on display at Cortez’ Pilsen gallery Antena, that focuses on Latino artists taking up the immigration issue in a variety of ways, with uneven results. Adjacent to Cortez’ piece is a large printout image of performance artist Jenny Priego dressed as a Mexican revolutionary, standing in a windblown cinematic landscape. Posted information lent the picture context, but the unimpressive image quality and the ironic undertones of Cindy Sherman’s well-known self-portraits undercut the photo’s impact. The least satisfying piece in the show was Jaime Mendoza’s list of migrants who died en route to the U.S. last year. While artist Chris Burden managed to create an alternative Vietnam War memorial to honor about three million slain Vietnamese, Mendoza’s incomplete list may have included eighty of the estimated 191 who died in the Arizona desert in 2009. 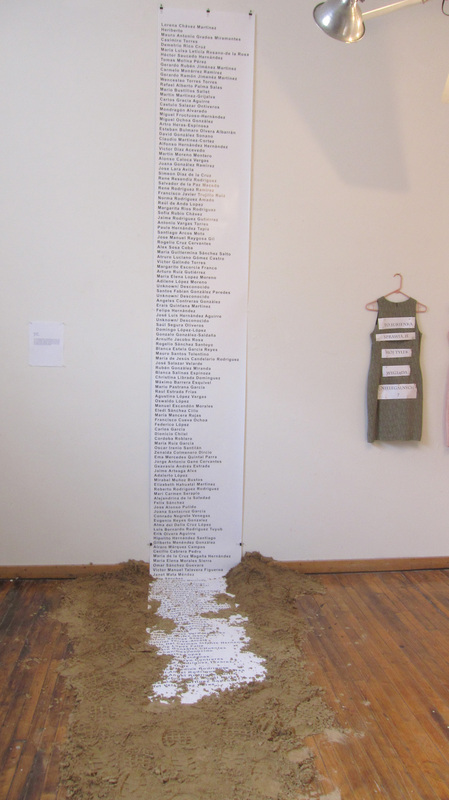 Neither minimal nor monumental enough to have weight, and trailing off unimpressively into a footstep-pocked muddle of sand on the floor, this Kinko’s large-format printout provides a prime example of why the formal qualities of political work should not be diminished in deference to the moral authority of the art or the artist. Salvador Jimenez-Flores definitively avoids the problem of insufficient monumentality. 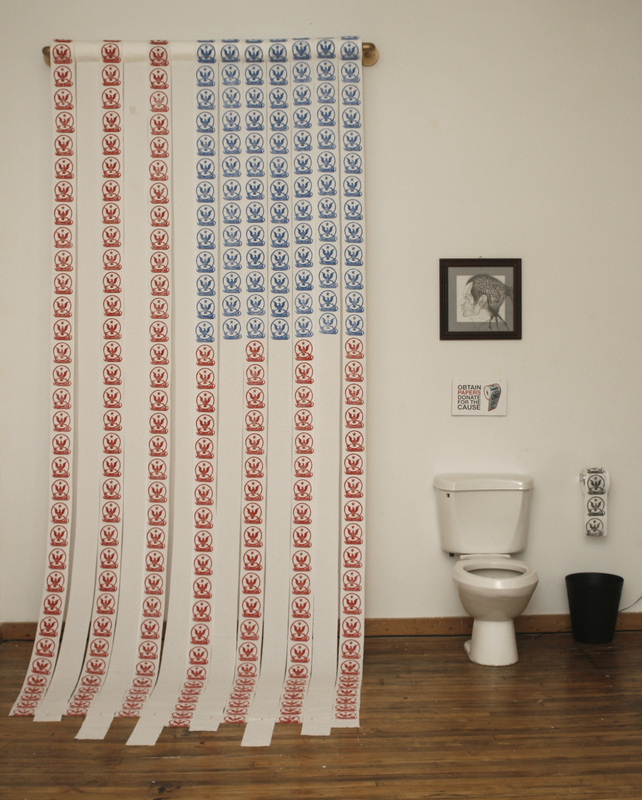 His installation features a long bar installed high on one wall, from which thirteen rolls of toilet paper descend to the floor, printed with red and blue linocut prints bearing the image of an eagle and the phrase “U.S. Citizen,” arranged such that the streamers as a whole suggest a large American flag. Next to this is a toilet with video images of walking feet, and another toilet-paper roll of black prints, which the viewer may take in exchange for donating (in a trash can) to efforts to fight the Arizona border law. Above the toilet is an X-ray-styled drawn portrait, a profile of the artist with profusely sprouting dreads—a racial profile, if you will—labeled “SB 1070.” This drawing is echoed by a similar portrait on a graphite-filigreed horse skull, perched on a pedestal a few feet away. Didactic but enthusiastic, Jimenez-Flores’ energetic juxtapositions and deliberate craft is not matched by Saul Aguirre’s series of text-based digitally collaged photos, which, while they engage in clever Spanish wordplay (the term “USA2,” for example, is the frequently-used shorthand for “usados,” the plural of “used”), have less going for them in terms of their designs—which somewhat resembled custom e-Cards. Elvia Rodriguez-Ochoa has more luck with pro-immigrant slogans (including a provocative statement on objectification of illegal female bodies) painted on vividly colored dresses hung on plastic hangers. While giving a feminine voice to messages of defiance, however, the latent aggression of the piece was constrained by indifferent execution. My favorite computer-based piece was one I arrived too late to experience. 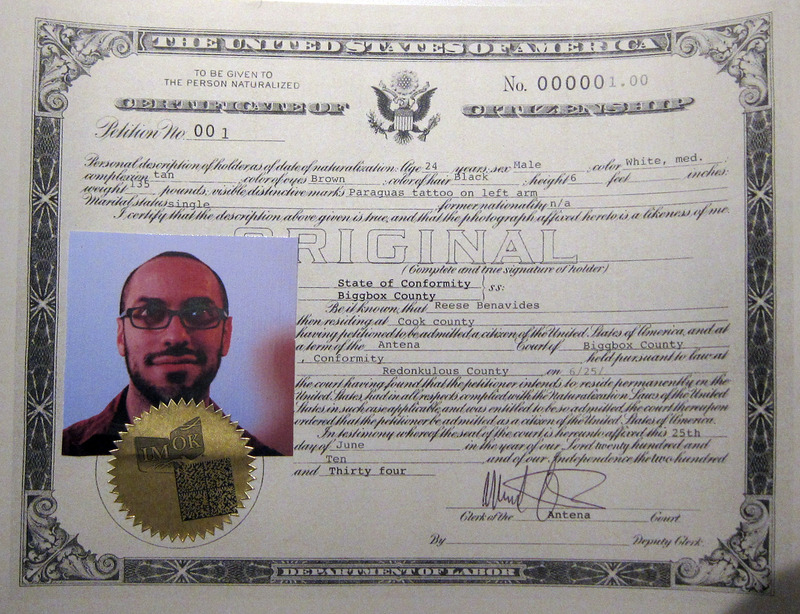 Adriana Baltazar’s performance consisted of giving citizenship tests to gallery visitors; after having them complete naturalization paperwork and answer questions about U.S. history, she created certificates featuring the visitor’s photo, and authorized by Miguel Cortez as gallery director. Like Cortez’ video, and perhaps even more like Dominguez’ new-media interventions, Baltazar’s performance cuts with elegant ethical simplicity right through the anger, trauma, guilt and anxiety that swirls around the questions of inclusion and exploitation provoked by the immigration debate. But one question remains, which will always be an open question: when is it fair to use mainstream standards to judge the artwork of a subculture, a minority community, or a persecuted population? The answer to that question affects Ricardo Dominguez and the international ghetto of elite fine art, just as much as it affects conservatives in and beyond the Southwest, and the Latino visual art community in and beyond Chicago. “Sangre, Sudor y Papeles” shows at Antena Gallery, 1765 South Laflin, through July 24.